SNOW WHITE AND THE HUNTSMAN, MEN IN BLACK 3 and THE AMAZING SPIDER-MAN – three of this summer’s blockbusters – are all worth catching now they’re on the small screen. A fairy tale, aliens, and a comic book hero make quite a combination when it comes to summer blockbuster viewing. But the success – and my enjoyment – of a new version of a classic now titled SNOW WHITE AND THE HUNTSMAN, the latest exploits of those dynamic agents J and K in MEN IN BLACK 3 and a reboot of the story about an ordinary boy who became a superhero in THE AMAZING SPIDER-MAN, have given me something shout about now they’re available to watch on DVD / Blu-ray or On-Demand. First up is THE AMAZING SPIDER-MAN, Mark Webb’s reboot of the Marvel comics superhero that not too long ago was brilliantly portrayed by Tobey Maguire. Now the very talented Andrew Garfield (who was superb in The Social Network and is no less eye-catching here) plays the new incarnation of Peter Parker. I was a big fan of the Sam Raimi films and so did feel it was little soon to shoot off another version but hey, it’s a successful franchise that the studio wants to continue and so here you are. The film is well handled by Webb, with the requisite mixture of action and quieter dramatic scenes – in particular, a nice relationship between Emma Stone‘s effervescent Gwen Stacy and the initially introverted Peter – there’s an effectively troubled villain in Rhys Ifans’ Dr Curt Connors and the movie also has its collection of excellent character actors to give weight to the material, notably Martin Sheen now playing Uncle Ben and Denis Leary giving his usual terrific wise-cracking edge to a role, this time as Gwen’s dad Captain Stacy. This is an entertaining new take on the story that features some very good young actors in the main roles. It’ll be interesting to see them grow in the next movie that’s due to arrive in spring 2014, where we’ll witness the very smart casting of the brilliant Shailene Woodley as the new Mary Jane Watson, who I’m sure will create an intriguing little triangle between the three characters that’ll be good fun to watch. Next, we have MEN IN BLACK 3, the long-awaited re-teaming of director Barry Sonnefeld with stars Will Smith and Tommy Lee Jones, as the agents of the super secret division assigned to keep an eye on alien trouble on Earth. And the first thing you notice right from the off is how Will Smith looks exactly the same as where we left Agent J in Men in Black II a whopping ten years ago – amazing! Anyway, here he has to journey back to 1969 to save good old Agent K (otherwise known as the incomparable Tommy Lee Jones) from meeting a rather nasty end, courtesy of an even nastier alien (played with gusto by Jermaine Clement) so that he’ll survive to meet J in the future. Got that? Basically, it’s the cue for a ton of clever jokes to provide a counterpoint to an ultimately quite touching human story. Emma Thompson provides excellent support as Agent O, the new head of MiB and Josh Brolin is really outstanding as the young Agent K, delivering a spot-on Tommy Lee Jones-esque performance. There are also nice supporting turns from Michael Stulbarg as a very sweet alien called Griffin who’s so unlike the kind J and K usually run into, and Alice Eve is very winning as the young Agent O. It all adds up to a very enjoyable way to spend a couple of hours. 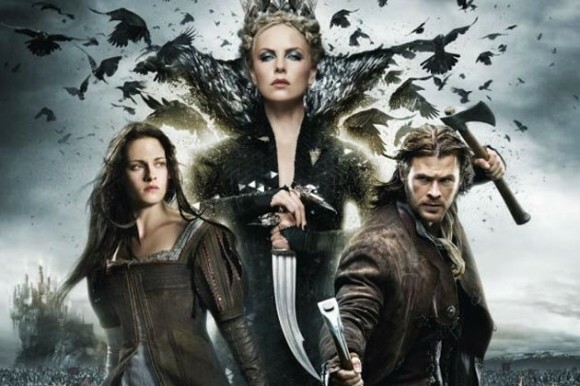 Finally, there’s the visually stunning SNOW WHITE AND THE HUNSTMAN, that pits Kristen Stewart’s bold princess against Charlize Theron’s very wicked queen in director Rupert Sanders new interpretation of the classic story. Having been imprisoned for years by her evil stepmother, Snow White escapes only to be tracked down by Chris Hemsworth‘s impressive Scots-accented Huntsman under orders from the queen. But then he thinks better of the offer he’s been given if he kills the princess and so we’re off on a new journey of revolution and redemption that director Sanders makes a feast for the senses, with several stunning sequences – the battle on the beach being a real highlight. On top of all that, the seven dwarves turn up and when they’re played by the likes of Toby Jones, Ray Winstone, Ian McShane, Eddie Marsan and the marvellous Bob Hoskins, you know you’re in for a treat. I particularly enjoyed Hemsworth’s performance as the conflicted Huntsman, giving real depth to the character’s dilemma and backstory. He did the same in Thor and The Avengers and he’s no less striking here, showing a fallen man who finds faith in something again, being slowly caught up by Snow White’s beauty and spirit. Stewart brings a lovely earnestness to the princess, that’s just occasionally let down by a script that doesn’t always allow her to articulate what she’s feeling. Theron gives it her all as the villainess Ravenna, creating a really dark, feminist heart to the fairy tale and she’s nicely supported by Sam Spruell as her very errant brother Finn. The film has so far grossed nearly $400 million worldwide and so I would think we’ll see a sequel so we can watch how they’ll develop the dynamic between Snow White, her Huntsman and her Prince (passionately played by Sam Claflin) in the next instalment. As I said, triangles are always great to watch unfold. That initiative called The Avengers so works!